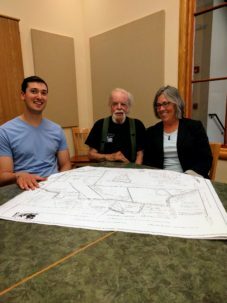 On June 12, 2017, Saratoga PLAN finalized a perpetual conservation easement to preserve the 59+/- acre Carpenter Farm, located in the Town of Galway. Property owner Donald Carpenter is donating the easement in order to conserve the land for agriculture, forestry, wildlife habitat, water resource protection, scenic beauty and public recreation. The property is situated in a rural historic landscape with scenic charm. Transactional costs for the project were partially funded via a grant from the Dockstader Charitable Trust. Over the coming months, Saratoga PLAN will be raising funds for the Stewardship Fund to ensure the organization can uphold the terms of the conservation easement in perpetuity. Nurtured by his family’s heritage and farming community, Don’s childhood experiences ripened into a dream and vision. At heart, Don Carpenter is a farmer. It’s because of his heart and connection to the past that Don purchased 59 acres in Galway. His passion became his way of life, a life filled with days working the fields and walking the woods. A life spent connecting with a place that brings serenity – a place that nurtures the mind and heart. As a career surveyor, Don knows land and the landscape of Saratoga County – a landscape that he has seen change dramatically over the years. Which is why, for Don, conserving his farm is so important: For him, it’s about sustaining an exceptional way of life that is disappearing.